I just upgraded to MacOS X Mavericks and can highly recommend it. It’s an amazing update, especially considering it’s free. You may not be a Mac user, but one thing that is quite interesting is the degree that Apple has gone to save battery power in Mavericks. First, note that this displays (by default) processes that have run in the last 8 hours, not just currently-running processes. This is a new option for the Activity Monitor, and is necessary if you’re really going to see energy usage, even for processes that ran and stopped while you weren’t looking. Second, note that it displays Energy Impact and Average Energy Impact values. 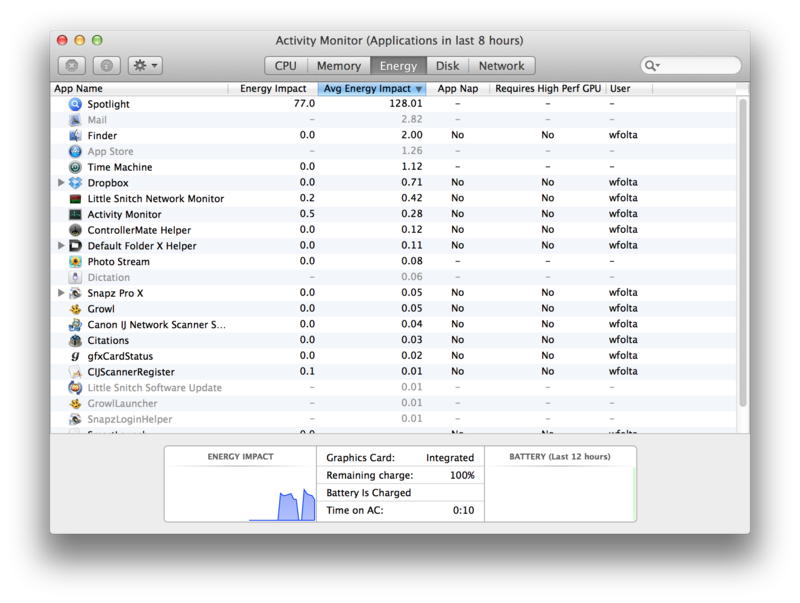 If you have the battery status icon enabled in the menu bar, you can also pull it down and see the top “Apps Using Significant Energy”, which reflects the Energy Impact value. No better way to get app developers to take advantage of energy-saving features — and avoid energy-wasters like active polling — than to post them up. Third, App Nap is an OS feature that apps can take advantage of, and Requires High Performance GPU indicates what apps have switched the system to the dedicated GPU instead of using the more-energy-efficient Intel graphics. In conjunction with App Nap, which apps can take advantage of to use less CPU, the new OS also clumps process awake-times together, to make longer stints of idle time possible, further saving power. Pretty cool predictive stuff here. Which all adds up to an OS upgrade can extend your battery’s life by up to 25%. I find that astounding. Add in new CPUs, like Intel’s Haswell, and the industry’s making amazing battery-life strides.